You surely know .com, .net or .info domain names. You have probably also heard about – or even registered – domains ending with .de, .fr and co.uk. You might even be aware of the new breed of domain extensions such as .club or .marketing. But did you know that the total list of domain extensions is 882? 882! The infographic below is a timeline from 1985 to 2017, which lists the birth year of every domain extension since .com in 1985. It took us hours and hours to put this resource together. If it helps you, then please share it. Thanks. 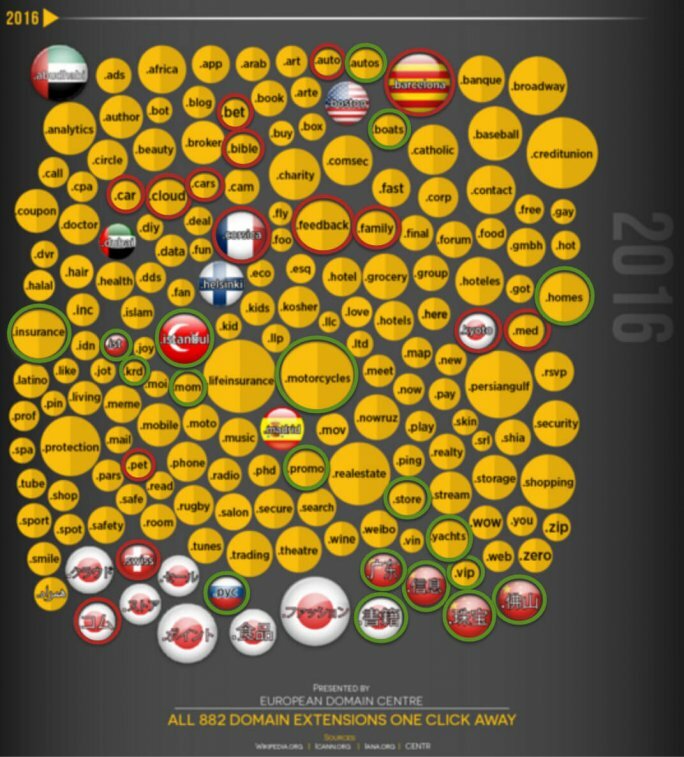 300M domain names were reached in Q4 2015 according to DomainWire Global TLD Report. Over the last two years the number of domain extensions has increased from 273 top level domains to 882 including the ones launching this year. New companies use them to stand out (E.g. lix.tech, a Danish startup digitalizing study books). Existing businesses change web address to communicate sharper with their audience (E.g. Oregon based veterinarians Animal Health Associates skipped animalhealthassociates.org for aha.vet). Businesses use them to build a safer platform (.e.g. American bank choicebank.com just changed to choice.bank). Newly opened Twin Rivers Golf Club in Waco, US registered twinriversgolfclubwaco.com, when they could get twinrivers.golf instead. A 22 characters .com domain instead of a short, brandable radio test approved web address. I have marked with red the domain extensions, which went live in 2016. The ones in green have announced their launch dates. Currently on hold. An industry source expects that the .music top level domain won't go live for years to come. The various applicants will block it in accountability procedures and lawsuits, when delegated to the winning applicant. We've been waiting for the African continent's main domain extension since 2006. 2017 seems to be they year it will go live. This is Rick "The Domain King" Schwarz' favourite new domain name extension: "If this was a horse race, .web would win before most others are out of the gate". Currently in contention but expected to go live in Q4 or possibly Q1 2017. Google paid a record breaking USD 25M to become the .app registry. They still haven't announced, when this top level domain will go live, and it's a really good question, if they will keep it for themselves. How so? They already launched .soy, .how and .みんな , but on their official list of future launches .app isn't listed. Panama based registry Primer Nivel paid an estimated USD 20M for the rights to .blog. CEO Gerardo Aristizabal had no comments yet, when The Register contacted him in February about the launch plans.